by Christine Gibson, former editor at American Heritage magazine. Given that many fans think Elvis is still alive despite his death certificate, highly publicized funeral, and gravestone, it’s no surprise that misunderstandings abound about his career. Among those events surrounded by fallacies—perhaps because it strongly affected popular culture as well as Elvis’s work—is his legendary first appearance on the Ed Sullivan Show, 49 years ago today, on September 9, 1956. Books and periodicals mentioning the show, which broke ratings records for the young medium and was one of the first to bring rock ’n’ roll to a mass audience, have erroneously reported that Elvis was shown only from the waist up, a triumph of censorship and evidence of the continued prudery of the 1950s. Others, aware of the hoopla surrounding the program, remember it as Elvis’s first performance on TV. The truth, as usual, is a little more complicated—and more interesting. The reaction was enough to make Steve Allen, who had booked Elvis for his show before the backlash, briefly consider reneging, but in the end, Elvis did appear on his show on July 1, although in strangely tame form. Allen, going comically overboard to avoid scandal, dressed him in top hat, tails, and white gloves. Elvis soldiered on gamely, singing “Hound Dog” to a top-hatand bow-tie-clad basset hound. 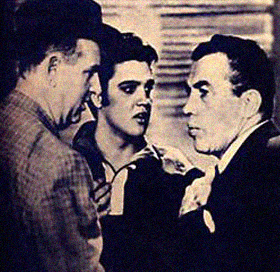 Sullivan, never a fan of controversy, had already refused an offer to hire Elvis for $5,000. The famously prickly host had been burned before by rock ’n’ roll stars: He vowed to drum Bo Diddley out of television after his 1955 act on the show, when he sang his own hit “Bo Diddley” instead of Sullivan’s request, Tennessee Ernie Ford’s “Sixteen Tons.” But Elvis’s ratings—his stint on the Allen show had trounced Sullivan—changed his mind. Even as he professed to the press that Elvis was “not my cup of tea,” Ed Sullivan had already begun negotiations with Elvis’s agent, Colonel Tom Parker. His hesitation cost him heavily, however. He would end up agreeing to shell out $50,000 for three appearances, an unprecedented sum. Elvis, wearing a loud plaid jacket, greeted the audience from a set decorated with stylized guitar shapes. He announced that the show was “probably the greatest honor I have ever had in my life,” and then launched into “Don’t Be Cruel.” The camera stayed above his waist for now, sometimes closing in on his face, sometimes turning to show his backup singers, but something Elvis was doing out of lens range was causing unexplained screams from the audience. After the number was over, he acknowledged the vocal segment of the crowd, saying, “Thank you, ladies.” To finish the first segment, he played the title song to his new movie, “Love Me Tender,” introducing it as ”completely different from anything we’ve ever done.” Nationwide, disk jockeys taped the performance and played the song, which had yet to be released, on their radio shows, increasing pre-release orders to almost a million and pushing forward the single’s release date. Viewers got to see the full Elvis—legs, hips, and all—during the second segment, when he performed the up-tempo Little Richard song “Ready Teddy” and two verses of “Hound Dog.” Young rock fans today would doubtless have a hard time understanding what all the scandal was about, as his frenetic swivels and shuffles look chaste compared to the gyrations common on MTV. But Elvis on that night (and his rock star peers in general around the same time) arguably set in motion a trend that continues today. The viewing audience certainly wasn’t so offended that it changed the channel. The September 9 Sullivan show reached 82.6 percent of the TV audience, and Steve Allen hadn’t even seen fit to offer an alternative; NBC had showed a movie instead. Censorship did enjoy one last gasp during Elvis’s third appearance, on January 6, 1957, when Sullivan—or, as some historians believe, a publicity-hungry Parker—did indeed instruct the camera operator to show him only from the waist up, even when he sang the gospel tune “Peace in the Valley.” It was the last song he would ever perform on the show. Parker was now demanding $300,000 for future TV engagements, stipulating that a network must also commit to two guest spots and an hour-long special. Even as he priced his client out of its range, Parker credited the program with the success of “Love Me Tender” and earning Elvis the esteem of American adults for the first time. Historians assert that Elvis’s three nights on the Sullivan show helped bridge the gap between the first rock ’n’ roll generation and their parents. Whether at the same time his behavior on those shows ultimately caused today’s generation gap—that is, whether MTV’s rump-shakers should look to Elvis as their earliest role model and parents can blame him for Britney Spears—is still up for debate.